As with muscles and bones in the body, the brain experiences a certain amount of deterioration with age. Keeping the brain supple, sharp and active is imperative In order for older adults to live a healthy and long life. Studies show that you can promote brain health by following some simple guidelines like getting enough sleep, maintaining a nutritious diet and not smoking. In this article, we’ll look at some additional engaging ways to help promote cognition and create more brain energy. Henry Ford once said, “Anyone who stops learning is old. Whether at eighty or twenty. Anyone who keeps learning stays young.” There is now ample scientific evidence to back up Mr. Ford’s claim. Learning a new skill, taking a class or finding a new hobby can actually create neural pathways in the brain, something that’s important for maintaining brain health. In addition, endeavoring to learn something new will challenge, energize and help create new social connections – something that also promotes brain health. Spontaneity can give your brain a much-needed jolt and can often add more fun and joy to your day. It can be as simple as changing your mealtime routines, unexpectedly calling a friend or trying an exercise class that you’ve never been to before. Trying something new and unexpected may also be contagious, and friends and family may want to join in the fun. Brain games can help you learn to perform functions faster while enhancing your reasoning skills and mental dexterity. If you have access to the Internet, finding and playing online brain games can be a fun way to pass the time and improve your brain health. Crossword puzzles, card games and Sudoku are also great options for keeping your logic and reasoning skills sharp. Games can also be an opportunity to socialize and practice thinking on your feet. Consider organizing a “Game Night”. Pull out an old favorite like Scrabble or Monopoly, or try something new such as an unusual card game or strategy-based board game like Risk that will offer a challenge but also a lot of fun. A new brain experience can be found by looking no further than your local library. If you’re already an avid bookworm, challenge yourself to read something totally new and different. If you’re not big on reading, now might be the ideal time to look for a new genre. If you love historical fiction, try something completely different like a mystery novel. You might also consider looking for books that instruct on starting a new craft or learning a foreign language. You’ve heard it time and again, but it’s because it’s the truth: exercise is good for your brain. Moving your body through exercise increases oxygen and blood flow to the brain and can help reduce stress levels. Whether you decide to try a new dance class, take a walk around the block or try a “sit and be fit” class, exercising can help you live a longer and healthier life while keeping your mind and body active. Whether you attend a place of worship, meditate or find inspiration in nature, spirituality can help you fight depression, stay grounded and provide a sense that there is something greater than ourselves. Spirituality can help you remain more positive and can also help you forge connections with like-minded people. Being connected to the outside world and other people offers a sense of belonging which is beneficial for your overall well-being. Making new connections can help combat depression and motivate you to stay engaged socially. Whether it’s talking to a neighbor or taking a class with an acquaintance, making and sustaining friendships can bring you joy and help boost brain power. 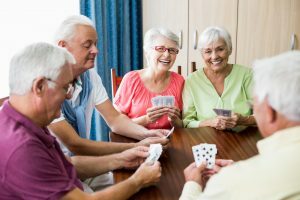 Being part of an active and vibrant senior community like Lighthouse Senior Living can help you create supportive, sustainable friendships. To learn more about Lighthouse Senior Living, contact us to schedule a tour today.